Winner of the American Library Association Video Round Table's Notable Videos for Adults award. When single mom and filmmaker Yuka Sekiguchi (Senso Daughters, When Mrs. Hegarty Comes to Japan), overweight at nearly 200 pounds and fast approaching fifty, determines to lose weight in hopes of becoming healthier and happier, she decides to film her struggle, figuring that public humiliation will be a strong incentive to succeed. FAT CHANCE, by turns serious and humorous, chronicles her six-month effort, involving experiments with fad diets, machines that claim to break down body fat, exercise programs, diet shakes, and consultations with an obesity expert, a psychiatrist, and a plastic surgeon. 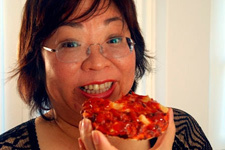 Although it should be easy-just eat less and exercise more, right?-Yuka discovers that her love of food, especially her weakness for pizza and chocolate, is hard to overcome, leading to a yo-yo experience of dieting and bingeing. But her health problems, including high blood pressure, difficulty in walking and sleeping, and the possibility of developing diabetes, makes her a desperate woman on a mission. 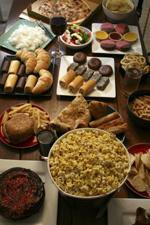 Although Yuka learns much from experts such as Dr. Gary Egger, founder of GutBusters, and plastic surgeon Dr. Sean Nicklin (on whom she develops a crush, renewing her interest in men after many years), her deepest insights are gained from her sessions with psychotherapist Dr. George Blair-West, a specialist in the psychology of overeating. Discovering the emotional roots of her overeating, Yuka comes to term with some deeply personal issues and, in the process, learns not just about her body, but also finds herself. What is happiness? And how do we get more of it? Visiting leading figures in positive psychology and observing clinical experiments, this is a light-hearted but serious investigation.